Shoulder injuries can keep us from the gym, from playing with the kids, even from sleeping soundly. Read on for shoulder impingement stretches that will help keep the pain from getting in your way. It’s really only been bothering you when you’re at the pool swimming laps, so you don’t think too much off it, and assume it will clear up. But it’s been a few weeks, and you start to worry that the pain is getting worse. You wake up in the middle of the night one night, lying on your right side like you usually do – but with another nagging pain in your shoulder. After a night of tossing and turning, trying to avoid that side, you shuffle out of your house in the morning, exhausted, and climb in the car. You’re pretty annoyed at the lack of sleep, and your shoulder is feeling kind of achy, but alright. That is, until you reach behind yourself to grab the seat belt and – WHAM. You’re hit with much more intense pain. It’s possible that shoulder impingement has struck. What’s a Shoulder Impingement, Anyway? “Shoulder impingement” is a clinical, blanket term, not a definitive diagnosis. Impingement means that some soft tissues are being compressed or pinched, so (you guessed it) shoulder impingement just means soft tissues of your shoulder are compressed. The term doesn’t really tell you much about what structures are involved or the root cause of the problem and there are several different culprits. The 2 most common structures involved are the bursa and rotator cuff tendon. The space under the acromion process of the scapulae, where tissues and tendons pass is called the subacromial space. This space can be decreased from poor posture and when this happens, the bursa that ensures the head of the humerus moves smoothly in the glenohumeral joint gets impinged and can become inflamed. Rotator cuff tendons can also be impinged and the result is the same – irritation and inflammation . Usually, shoulder impingement symptoms will gradually intensify  as whatever inflammation is causing the pain slowly gets worse and more irritated over time if you’re not taking the appropriate steps. The pain becomes really apparent when you try to move your arm overhead – like maybe when you go to throw a ball or make a stroke with your arm as you go for a swim. The pain also tends to become noticeable when you lie or sleep on the affected side. As the condition develops, you may just start to feel constant pain in the affected shoulder . Other movements that commonly spark shoulder impingement pain are shoulder abduction (lifting your arm out to the side) or trying to reach behind you (shoulder extension). We’ve mentioned a few structures of the shoulder that are involved in impingement, but let’s dig a little deeper. The scapula, the clavicle and the humerus all come together to form the shoulder joint. The humerus sits in a very shallow cavity, the glenoid cavity, on the lateral side of your scapula. Above this is the subacromial space and the acromion – that bony scapular process we talked about earlier. The tendon of the supraspinatus, a rotator cuff muscle, passes through the subacromial space. On top of the rotator cuff tendon sits a bursa, which helps with smooth movement at the joint . The tendon attaches to the head of the humerus, which is covered in articular cartilage. This cartilage also helps support movement at the shoulder joint. There can actually be two different places where a shoulder impingement can occur. It can occur on the bursal side of the rotator cuff, in what’s called an external impingement. This is the most common type, and what people are generally referring to when they say “shoulder impingement” . However, the impingement can also occur on the articular side of the rotator cuff tendon, also known as internal impingement. In these internal impingement cases, it becomes crucial to focus on strengthening the rotator cuff and its ability to stabilize the shoulder, because weakness here is likely the factor that caused the injury . With that in mind, let’s learn a little more about what the rotator cuff actually does. The rotator cuff muscles run from the scapula to the humerus and yes, work to rotate the arm. BUT their true function is dynamic stabilization of the humeral head in the glenoid cavity. This is important because maintaining proper movement patterns is crucial to shoulder health. As we learned a moment ago, deficiencies here can lead to internal impingement. Scapulohumeral rhythm, or the coordinated movement of your humerus and scapulae, is a key part of this – an improper movement pattern between these two bones can easily lead to impingement and it’s easy to visualize why. That would bring your acromion down and your humeral head up – reducing that subacromial space. This is exactly what happens when you keep your scapulae depressed when reaching overhead. Even if you’ve been taught that this is proper form – you’re setting yourself up for a potential impingement. To maintain proper scapulohumeral rhythm, you need to let your scaps elevate in a natural way when you reach overhead – which is upward rotation and elevation – preventing tissues in your shoulder from getting unnecessarily impinged. As you can see, there’s a lot going on in your shoulder. And as such, a lot of different causes can be contributing behind the scenes to shoulder impingement. Kyphosis, or an exaggerated curve in the thoracic spine can round your shoulders forward and create a hunch back. This curvature can mess with the alignment of your shoulders and interfere with proper movement. If your scapula and humerus aren’t working together with the proper rhythm, shoulder impingement becomes more likely. Winged scapula (a protrusion of the medial border of the scapula), typically caused by weak serratus anterior muscles contribute to improper stabilization of the shoulder joint and can lead to impingement. Tight pectoral muscles, a tight latissimus dorsi, or a combo of both lead to shoulder internal rotation and protracted scapulae (rounded shoudlers) and can also interfere with proper upward rotation of the scapulae. Check out this technique and learn how to effectively stretch your tight pecs and gain lasting mobility. Consciously utilizing improper movement patterns – especially keeping scapulae retracted and depressed during overhead movements – can lead to an impinged shoulder. There are a couple of easy tests you can perform yourself that will help clue you in if you suspect shoulder impingement, or if you think you might be at risk. For this test, use the hand on the affected side to grab the opposite shoulder, bending at the elbow. From here, try to elevate the shoulder and lift the elbow. If this causes pain, a shoulder impingement is likely . This test will help clue you in to some alignment issues that may put you at risk for shoulder impingement. All you need to do is grab two pencils and hold one in each fist. Let your arms relax down to your sides normally. Now take a look and see where the pencils are pointing. Ideally, they are pointing more or less straight ahead. But for many folks, they tend to point toward each other. This suggests that your shoulders are internally rotated . For this test, reach one arm straight up toward the ceiling, then bend at the elbow so your hand is reaching down your back, palm in. Now take your other arm to meet it by bending it behind your back, palm up. See how close you can get to crossing your fingers, and experiment with both sides. If your fingers aren’t close to meeting, you need to work on shoulder mobility . But don’t worry too much about it, because next I’m going to teach you 3 techniques that should both reduce pain and increase mobility. I recounted how my own personal experience with shoulder impingement, specifically subacromial bursitis in a previous article, so make sure you check it to learn how I developed the injury as well as a 5-step plan to overcome it. For now, let’s get on to the shoulder impingement stretches. Another factor that can contribute the shoulder impingement is the shape of the acromion. In some cases, it has a downward curved or hooked shape, which serves to reduce the subacromial space. 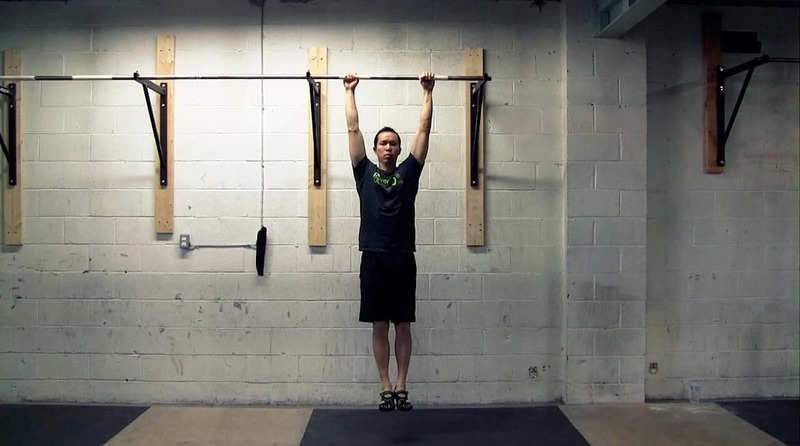 To fight this, one great stretch for shoulder impingement is to simply hang from a bar. This can help to reshape the acromion and decompress the shoulder . Try to hang for 10-30 seconds at a time, for a total of 3 to 5 minutes throughout the day. If supporting your entire bodyweight like this is inaccessible, grab a chair and use it to support some of your weight. This shoulder mobilization drill has a ton of benefits for your shoulder joint. For one, it will provide decompression and encourage blood flow. It will also gently mobilize the posterior capsule of the shoulder, plus help scour the joint. This drill will also help build control of the scapulae in multiple ranges – adding to the stability and mobility of the shoulder as a whole. This move is a great isometric exercise that will work on training shoulder extension while the scapulae are retracted – i.e., the right way to extend the shoulders! This move is great for correcting rounded shoulders, so if you didn’t do so hot on that pencil test, get to it with this move. These shoulder impingement stretches should help to eliminate pain if you’re already dealing with an impinged shoulder. But best of all, they should also help prevent the condition from ever developing by encouraging proper shoulder alignment, mobility, control and strength. If you do have shoulder impingement, it’s critical to address all of the factors that can contribute, including posture, mobility and movement patterns.